I like to have “intelligent“ software, that isn’t very technical so you have more time to be creative. Marcus Schmahl is a true musician who has been working as a composer, sound designer and producer since 1992. 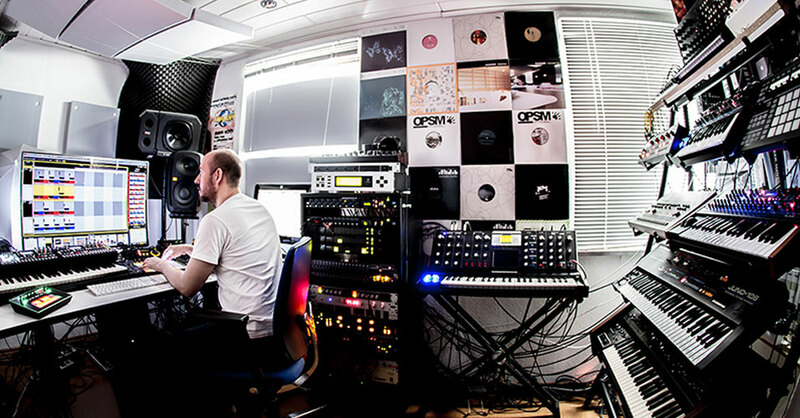 He is the driving force behind music projects of different genres such as hip hop, downbeat, jazz, lounge, house, techno, electronica, electro and drum’n’bass and the lead behind the alias “Broombeck”. He has concentrated on Electronic Dance Music and released his successful tracks on influential labels like Mistakes Music, Opossum Rec. and Terminal M.
WaveDNA sat down with Marcus to discuss his use of Liquid Rhythm, and welcome him to our official artist roster. 1) When did Broombeck start to become a reality for you? Electronic music was all around me during my childhood and listened to a lot of hip hop, early house and techno. It influenced me to look into music production. During the early nineties my main club was the legendary “Omen“ in Frankfurt (Germany), where Sven Vath began his career. I started to work within the music business in 1993 doing some commercial ads for companies, but never lost my focus doing my own musical projects. First I had the chance to release some albums on Elektrolux (very famous Frankfurt based electronica/chill out/dub label) as Rauschfaktor, Guardner and Professor Kazkaz (a collaboration with Gregor Tresher). This pushed me more into the underground music scene and I tried to produce more club orientated tracks. With this new sound, a new persona was created and Broombeck was born. My first releases “The Clapper“ and “Mono Turn“ were my two top selling EPs which were at Beatport 10 for more than 6 weeks. Everyone played my tracks, even progressive house and house DJs. My main genre is still Techno, but I love all kind of electronic music, which influences my over all Broombeck sound. 2) Did you ever think you would get to where you are today with the Broombeck alias? I’ve come to know the music business for more than 20 years now and the one thing I learned was to never expect anything with your art. You judge art in a subjective way and feel music in a different manner as other people. This is why you can’t look into the future. Broombeck is a well known project in the underground music scene but I hope to make it bigger in future with my new album, a new live tour, and as a DJ playing for music lovers in clubs! 3) When did you start building your studio? I started building my studio in the same space space I have been working in since 1997, but it is a never ending story! If you follow me online, you will see that I rebuild my studio every week, and sometimes every day. I mainly do this to get a better workflow with my equipment. This is very essential for my work as a musician, because it moves different hardware pieces into my main focus every time I change the places of some hardware. New arrangements in hardware means new motivation, new possibilities, new ways of combining sounds and gear for me. The same is with trying new software on my computer. 4) How much gear do you have? Far to much!! That’s why I can’t say a number. I’m the biggest nerd when it comes to gear – like any other dj or producer – so I am always buying a lot. But with like I had mentioned before, I am constantly rebuilding my studio and re arranging things so i’m always selling some gear too. Usually gear which I have too much in my songs, EPs, and albums. 5) What is your go to piece of hardware and software? At the moment I really love the hardware that swedish company Elektron have developed. Especially Analog Rytm (an analog drum-synth-sample—sequencer). They create mind-blowing hardware for studios and live performances. On the software side my main DAW is Ableton Live 9. I really like the way you can jam with hardware combined with software stuff or real instruments/recordings without limitations. They make integration of both of these elements very easy and simple. I also have Ableton connected via max4live to WaveDNAs Liquid Rhythm as this is my preferred way of creating beats, grooves, and special loops for my productions. I like to have “intelligent“ software, that isn’t very technical so you have more time to be creative. 6) When did you hear about Liquid Rhythm? I read about Liquid Rhythm a few months ago on one of the various blogs I follow. It looked amazing and I love playing with beats, grooves and rhythms, so I thought I would buy the full version and play around with it and I have to say, I am hooked! The possibility of controlling Liquid Rhythm with an Ableton Push is a great addition to the software and makes in very simple to use in a live setting. 7) What got you most excited about Liquid Rhythm? It’s great to see how an intelligent software algorithm can add different grooves to different drum slots of your drum rack within Ableton Live, which sounds absolutely great in a combination of all drum sounds. You have a huge variety of parameters, which you can tweak to build up grooves for any genre, without losing the overall groove. And as I said before, it is very easy to use Liquid Rhythm in a live setup, controlling both Liquid Rhythm and Ableton Live with only one Push controller. 8) How do you use Liquid Rhythm with your mix of hardware and software? Do you use it to program any external instruments? I have created a lot of drum rack presets for my daily work in my studio with Ableton Live. One for my Roland TR-909, one for Analog Rytm, and one for NI Maschine or NI Battery. These drum racks are automatically connected via max4live to Liquid Rhythm and I can drag’n’drop grooves to the different drum rack pads. Setting it up this way allows me to build drum grooves and whole beats without knowing which machine is playing the sound. It’s a nice way to combine hardware with software. 9) How has it changed your workflow? It hasn’t changed my workflow at all! For me it’s a huge addition to get more into grooves, and to add some randomness to my beats. It allows me to generate more variations and to be more creative in building new songs! If anything the only workflow change is that I now use Liquid Rhythm to generate my beats whether I am using software or hardware drum synths.